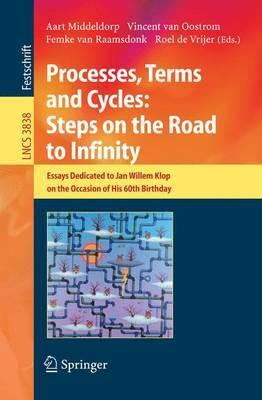 This Festschrift is dedicated to Jan Willem Klop on the occasion of his 60th birthdayon December 19,2005.Its focus is on the lambda calculus, term rewr- ing and process algebra, the ?elds where Jan Willem has made fundamental contributions. Without attempting to give a balanced account of Jan Willem's scienti?c achievements, we recall three accomplishments from the early years of his career that especially stand out. The ?rst is his counterexample showing that the extension of the lambda calculus with surjective pairing lacks the Church-Rosserproperty,or, in modern terminology, is not con?uent [7,9]. This settled a famous open problem, which had challenged several researchers in the lambda calculus community for years. The secondis his pioneeringworkintermrewriting.In hisPhDthesis,Jan Willem gave a systematic study of orthogonal rewriting in the general setting of combinatoryreductionsystems(CRSs),therebyputtingtheareasofhigher-order rewriting and orthogonality ?rmly on the map. Some of the ideas in the thesis trace back to the famous Blue Preprint , from the period that Jan Willem and some other students were graduating in mathematics and logic, under the supervision of Dirk van Dalen and Henk Barendregt. The third feat is the creation, together with Jan Bergstra , of the algebra of communicating processes (ACP). With his early work,Jan Willem provided inspiration for many years of fru- ful research, continuing to this day. For decades he has been a creative and stimulating force in the areas of term rewriting and process algebra. Some of his recent interests are in?nitary rewriting, graph rewriting and the geometry of processes.